Every day, smartphone users rely on mapping data for directions, weather and social media. But graduate students in a new mobile design course at USC are finding more creative uses for their phones, such as tracking unexploded bombs on old testing ranges or helping Los Angeles Metro workers navigate subway lines. The course was developed as a pilot program last year by Edward Pultar of the Spatial Sciences Institute at the USC Dornsife College of Letters, Arts and Sciences. Pultar, a researcher on travel behavior and social media mapping technology, saw a need for students to be prepared to enter the mobile world. Geographic Information Science (GIS) is a growing field with a need for more programmers, he said. The technology has a diverse range of applications, and creative students with mobile development skills have plenty of opportunities to use it outside the classroom. Organizations like the military and forestry service are looking at mobile apps that can yield real-time data about changes in the field, better known as remote environmental monitoring and mobile data acquisition. Pultar has firsthand experience in this area: He and his brother designed Valarm, a mobile data analysis app that tracks atmospheric changes, electricity usage and shipments in transit. They’ve used Valarm to compare air pollution particle levels from Palm Springs to Santa Monica, but there are many more mobile and stationary sensor applications possible. For example, a vintner in Santa Barbara uses the app to monitor the humidity and temperature of his vineyard as well as CO2 levels in his winery. The first year’s students were responsible for developing their own apps, several of which were designed to solve real-world problems they encountered in their jobs. That level of practicality was appealing to Chris Weidemann, who finds unexploded bombs at military testing sites across the country for a federal contractor in Washington, D.C.
Weidemann said the ordnance disposal industry traditionally finds and removes unexploded weapons using heavy machinery and metal detectors, in addition to documenting what was dug up with a camera, pen and paper. “We didn’t need to be carrying all that — you could replace it with a tablet,” he said. His app takes a digital map created by the heavy equipment and puts it into a more accessible, mobile format, tracking data entries and images at the same time. All of that is routed back to a database rather than being manually entered. The app is now in final testing, Weidemann said, and it has already provided a significant boost in efficiency. Michael Quant, another GIS student, is a software engineer for Los Angeles Metro, where his department maps out the location of equipment on Metro rail lines. He said the benefit of the class was being immersed in the Java and Android programming languages, as well as a plethora of online resources he could turn to for future reference. The course gave Quant a chance to develop a tool for work crews when they’re on unfamiliar lines. The app lets them promptly identify where certain equipment is kept. For new crewmembers, as well as those changing lines, it eases the transition as they find their way around. Though his app is still in development, Quant said the experience has given him a good base from which he can develop new tools in the future, building on the data he collected for his project. Weidemann, who is a hiring manager at his ordnance disposal company, said the skills he learned are exactly what he’s looking for when meeting new recruits. The GIS industry as a whole is evolving, he added. 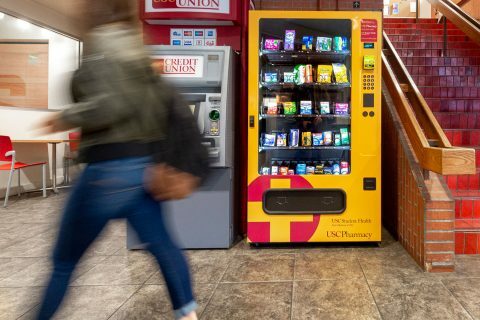 Thanks to the modern world of smartphones and at-your-fingertips technology, there are plenty of USC-tailored apps to make the day a bit easier for Trojans. A new partnership between USC and Google will bring convenience and new opportunities for online collaboration to USC students. 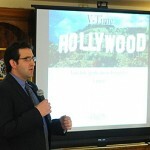 Josh Podell presents the idea for an app that would tap into the archives of the Hollywood trade publication Variety. Seventeen journalism, communication, engineering and business students from USC presented to four news organizations new concepts, backed by research, for mobile news applications tailored for each of their operations.